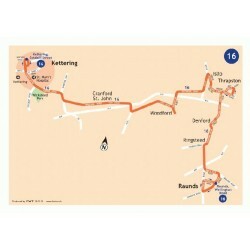 The 16 connects Raunds, Ringstead, Thrapston, Islip, Woodford, Cranford St John, Wickstead Park and Kettering. Route tickets are great value and give you unlimited travel on the service you buy it for, for your chosen period of 3 or 12 months. You can also use your ticket on parallel services serving the same points. When selecting your ticket, please ensure you provide the users name (these tickets are not transferable) and your chosen expiry date (please allow a minimum of three working days). We will post your ticket to you within 3 working days.